If you’re a fan of FPS video games or titles that put you into the first person perspective then it’s a safe bet that there will be a number of great titles releasing yearly for the genre. We decided to take a look at some of the best FPS games to have release in recent years. In this list we have installments to much beloved franchises to brand new IPs. Check out the list of games down below as these are some of our favorite FPS video games to have released in the past five years. Battlefield has been a franchise that focuses on war outside of America but within Battlefield Hardline, gamers get a taste of the war on crime. Instead of the military setting, the game has players becoming a thieving criminal or a member of the police Special Response Unit. Gamers will race through the busy streets in game modes that include heists, rescue missions, standard deathmatches, and even a makeshift capture the flag mode called Hotwire. While maneuvering around the world will be in a standard third-person perspective, players can also switch to a first-person view. Made as the successor to the previously announced and now canceled Tom Clancy’s Rainbow Six: Patriots, Tom Clancy’s Rainbow Six: Siege makes our list. Much like the Tom Clancy’s Rainbow Six franchise is known for, this is a tactical shooter with more of an active community of players online. The overall premise of the game is a fight between a group of terrorists and of course a Rainbow team. Just as a mentioned, there is a singleplayer narrative for gamers to go through, but as it stands right now, more players are picking the game up for its online competitive gameplay. Essentially, one team of terrorists will be seeking out a hostage while the Rainbow team must carefully breach a building and take down the terrorist group. Being a tactical shooter, there’s a bit more to the gameplay then running in and spraying bullets in each room. Instead of turning a home into an active war zone, there’s slew of gadgets and weaponry made to make kills effective and accurate. There may be times of a standstill while you prepare for a take down or breach, but if you have a team of friends ready and voiced online, this game could make for endless fun. Dying Light was created under Techland, who was also the developers behind Dead Island and as such, there are some clear similarities between the two. However, between the two video game titles, Dying Light certainly carries a more mature tone and bleak world. The video game follows an agent named Kyle Crane who is tasked with infiltrating a quarantine zone city of Harran which has become infested with a virus turning civilians into ruthless zombies. Interestingly enough, there’s a twist on the day and night cycle in Dying Light. During the day, the zombies are more lethargic and easier to deal with, though once the sun set’s they become more aggressive and harder to escape. Following up after the success of Battlefield 1 comes the upcoming release of Battlefield V. This video game will take players back into the gritty war of World War II. Battlefield V will showcase the brutal war that soldiers had to endure years ago. Much like Battlefield 1, this release seems to also feature war stories where players will step into the shoes of various characters as they fight for their rights and loved ones. Likewise, the weaponry and equipment will range from within the war and as such players will be fighting against the enemy with MG42’s, PIAT launchers, to even combat knives and axes. As a result, this will be a tough chaotic war that at times can get very close and personal. After wrapping up with their time with the Halo franchise, Bungie delivered fans a new franchise to enjoy known as Destiny. The video game is also a futuristic war game where players band together and complete a vast range of missions and game modes. However, there is currently a sequel to Destiny that is available to play right now. Call of Duty: Infinite Warfare might not have been the most welcomed Call of Duty title within the franchise, but it has a singleplayer narrative campaign that is set within space. Overall, the narrative is set in the future where a group known as the Settlement Defense Front is attempting to take over the Solar System. Stepping into the shoes of Captain Nick Reyes, a member of the Special Combat Air Recon is tasked with preventing the SDF from capturing the Solar System. When the video game was first revealed, there was some backlash when the competing franchise, Battlefield, announced the return to the gritty World War One time period with Battlefield 1. However, looking back there is still a full singleplayer narrative campaign to enjoy set in space with zero-gravity environments along with the fan favorite Zombies game mode. Released in 2017, developers Bloober Team crafted a psychological horror title based around a detective. Within the game, players take on the role of Daniel Lazarski who is a detective with an unique tool. During interrogations, Daniel is able to hack into peoples minds and investigate surroundings memorized by the person. This is one of those games that is best to go in with as little knowledge as possible due to the length of the game. Players who take the day off to enjoy a game can easily beat this in one sitting in just over five hours, especially if they are going for just the main narrative story. Wolfenstein: The New Order is a reboot of the iconic Wolfenstein franchise. The game puts players into an alternate universe where the world has successfully been taken over by the Nazis party. Overall, the game focuses on BJ Blazkowicz, a man who was once on death row but managed to escape and join the resistance to fight off the Nazis and regain a peaceful regime. For fans of the horror film franchise Aliens, owning a copy of Alien: Isolation is automatically a must-have. However, if you’re unfamiliar with the film, you can still find some enjoyment from this video game title. Launched back in 2014, developers Creative Assembly has released this survival horror title for a variety of platforms over the years. In terms of the film franchise, Alien: Isolation is set fifteen years after the events of Alien, where players will take on the role of Amanda Ripley, the daughter of Ellen Ripley who begins an investigation of tracking down the mysterious disappearance of her mother. Much like the old school survival horror titles, Alien: Isolation has an emphasis on players avoiding the hostile alien enemy. Instead, players must rely on some stealth mechanics to maneuver around the game. Alien: Isolation is a singleplayer journey and while there is a following, it’s unsure if we’ll see a sequel launch. Publishers to the video game, Sega, has stated that they are still considering putting out another title, but it’s unconfirmed if one is actually in the process. The Call of Duty franchise has been around for decades, but as of late the series has been turning towards more futuristic and current settings. That had changed last year with Call of Duty: WWII, where the franchise, much like Battlefield, took players back to a more primitive warfare. As the name suggests, Call of Duty: WWII is a look back into the Second World War and it definitely feels a bit more gritty and gnarly then we’ve ever seen the war before in a video game medium. Players are centered around a narrative that follows the 1st Infantry Division on the Western Front. An interesting little side note to toss into here is the fact that Call of Duty: WWII doesn’t feature an auto-regeneration for health. This has been the norm for the Call of Duty franchise, but with the setting of an old war filled with grit, courage and the horrors of being on the battlefield, players will need to seek cover and health kits to stay alive. Multiplayer is still very much a big thing with the Call of Duty franchise and the latest title is not missing any beats. You can still enjoy the various online game modes competitively and of course there is a Zombies mode to go through as well. Another 2017 release that makes our list is Black Squad, an FPS that has quickly started to make a name for itself. The video game was developed by NS Studio and originally released in Korea but it only recently started to spread to new markets. The game acts as a fast-paced military strategy shooter with an emphasis on free-to-play. Luckily for players, there’s no feeling of being at a disadvantage if you don’t opt to purchase anything in-game. Developers have made the game in which microtransactions are not required, instead, everything within the game can be bought with in-game currency that’s rewarded as you play. We’re interested in seeing how Black Squad grows as right now the title is only available as an Early Access game through Steam. Call of Duty: Black Ops III is the sequel to Call of Duty: Black Ops II. Taking place in 2065, most of the world has become too advanced causing warfare to resort back to soldiers doing most of the work on-ground. However, this time, the soldiers have the ability in using augmentations that will allow soldiers to become cyborg supersoldiers. Of course, the highly popular zombies mode was brought back giving players swarms of the undead to defeat wave after wave. The fifth main title within the franchise, Far Cry 5, takes place within the United States of America in a fictional Montana place known as Hope County. Within the narrative, Far Cry 5 pins players against Joseph Seed, a leader of a cult who has forced his way into controlling Hope County. As more innocent civilians become trapped and forced into submission under Joseph Seed’s rule, only a handful of resistance stands between Seed and his reign. Just as before, players can expect the title to deliver as a first-person shooter in an open world environment which can be explored either on foot or through vehicles. However, the campaign can be experienced both as a single player narrative or through cooperative multiplayer. Likewise, the game will include a map editor where players will be able to build maps with objectives to complete for when players finish the main campaign. The 2017 release of Prey from developers Arkane Studios is stated to be an FPS with survival horror elements. This is a futuristic title where players are set on a space station that has been tainted by a hostile alien species. During this exploration journey, gamers will be stepping into the shoes of Morgan Yu who must find a means to get rid of the alien species and escape the station. You may recall the Prey franchise from when it first launched back in 2006 and it’s worth mentioning that this is not a reboot or remaster. Instead, the developers identify Prey as a reimagining of the IP with a new narrative. Often considered an Overwatch clone, Paladins is still a fantastic game. There are some slight differences between the two hero-based shooters, but you’ll still find that each hero in Paladins will have their own unique abilities that they can bring in to the fight. Luckily, with Paladins, you can enjoy the game across several platforms making it a video game well worth trying out. With hero-based shooters becoming popular, Paladins is one of the video game titles that continues to make its way on gamers consoles and PCs. Likewise, the video game also holds a number of different gameplay modes which can be as simple as a Team Deathmatch or more focused missions type modes such as Onslaught where players must capture an area to gain points. The sequel to Destiny takes place after the events of Destiny: Rise of Iron. This title starts off with the Red Legion faction of the Cabal having attacked The Last City. Guardians are forced to flee and find new powers to face the Red Legion and bring order over The Last City once again. Just as before, there is new content being added to the game in order to extend narratives or competitive gameplay with other players. This is also a title intended for players to join together and play online. Superhot was a hit after indie developers first introduced the game as an entry to the 2013 7 Day FPS Challenge. The developers crafted a title in which players take control of a protagonist that must take down a slew of red glowing humanoids. However, the big catch to this title is that time only moves when you do. As a result, players can carefully and slowly move around the level in order to avoid being hit by bullets or other projectile objects. This simple concept grew from a small entry project for a competition to a full video game release on PC, Xbox One and PlayStation 4. Battlefield has always been about insane battles and with the fourth main entry in the Battlefield franchise, EA Digital Illusions CE expanded its gameplay tenfold. Battlefield 4 takes place six years after the events of its predecessor with the United States and Russia’s tensions growing to an all time high. Now with Russia aiming to overthrow China, the United States is forced into making a move before Russia becomes an overpowering force. BioShock and BioShock 2 were iconic titles and as such we’re not surprised when the game received a remastered collection just a couple years ago. The video games are brought back just as we remember them but of course with a new coat of paint. Likewise, the game collection includes the latest title to launch into the market BioShock Infinite. As I’m sure you’ve already assumed, this collection not only contains the main video game title narratives but also the downloadable content that released prior, making this collection quite filling to go through. Sold in retail as a two-disc collection, all three games will run in 1080p resolution with 60 frames per second so even if you dabbled into the rapture before, this new coat of paint makes replaying these games worth it. Call of Duty: Modern Warfare was a massive hit when it first launched into the market but now the game has received a full fledged remastered edition. The game came bundled with select editions of Call of Duty: Infinite Warfare where gamers can enjoy the enhanced graphics, rendering, lighting enhancements, updated animations and more. If you have yet to play Call of Duty: Modern Warfare then we highly recommend picking up the remastered edition for current platforms. Bungie really created a hit when they first released Halo: Combat Evolved and we can’t help but add the entire franchise for the Xbox One. Yes, we know, not everyone enjoyed the latest release Halo 5: Guardians from 343 Industries, but the previous installments are still enjoyable to go through with a friend. The infamous first-person shooter franchise, Doom, received a proper reboot from development team id Software recently. Just as the franchise is known for, Doom delivers gamers with nonstop action and violent combat as our protagonist must battle through a variety of demons in order to save the world from total destruction. Gamers take on the role of an unnamed marine as he battles against demonic forces both outside and inside Hell after the Union Aerospace Corporation sought to extract energy from the inner parts of Hell as a means to solve Earth’s energy crisis. However, after one of the scientists within the corporation made a pact with the demons in Hell, she opened a portal allowing the demonic invasion, leaving the unnamed marine the last stand against the end of humanity. Call of Duty: Black Ops 4 is a bit different in comparison to the past installments of the franchise. If you picked the Call of Duty video games in the past to go through the narrative campaign then you’ll likely skip out on this fourth installment due to the fact that the game only features multiplayer. Developers Treyarch has opted to kill the singleplayer campaign component to the game for a focus on multiplayer game modes such as the fan favorite Zombies and a brand new battle Royale mode. Players can jump online with friends and battle against each other in a wide range of game modes along with death matches. Far Cry 4 is the successor to Far Cry 3 and the fourth main installment of the Far Cry franchise. This time around, Far Cry 4 takes place in a fictional country of Kyrat which is located in the Himalayas. Civil war has broken out with the country of Kyrat now under the control of the tyrannical king Pagan Min. When players travel back to their home, they come face-to-face of Pagan Min. Upon escaping Min’s clutches, our protagonist must free Kyrat from its tyranny control, but with each choice, the country of kyrat’s fate may dwindle away. Titanfall is a mech/fps hybrid video game. The title released into the market back in 2014 where the game only included an online multiplayer mode. Within the game, players will battle it out both as on foot soldiers or in giant mech machines. If you have yet to play the game then you can expect a fast-paced battle experience though we suggest giving the sequel a go as it not only improves on the overall gameplay experience but also includes a singleplayer campaign experience. Wolfenstein II: The New Colossus follows the events of Wolfenstein: The New Order which alters historical events. With the Nazi Regime ruling the world, a military resistance looks to fight back within America, acting as the nation’s second American Revolution against the Nazi rule. If you haven’t picked up and played the first title then you’ll want to start from there as it acts as a reboot to the iconic Wolfenstein franchise. Both video game titles are available for current platforms and each is well worth picking up to enjoy, though neither of the two games offers a multiplayer aspect. Battlefield 1 gained widespread attention when it was first revealed by EA DICE. 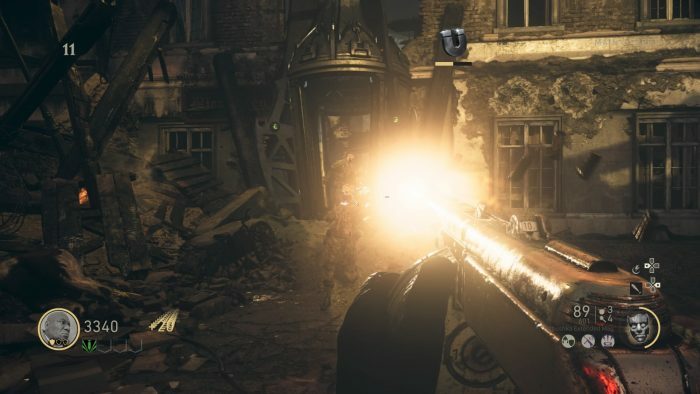 The video game would turn away from modern and futuristic time periods that Battlefield along with the Call of Duty franchise had been turning towards. Instead, Battlefield 1 takes place during the First World War. While keeping up with the same elements and mechanics that fans of the Battlefield franchise have been used to, Battlefield 1 showcases period-accurate weapons and vehicles. Players will use bolt-action rifles, artillery, mustard gas, along with tanks, horses, zeppelins, and more. Outside of the multiplayer component of Battlefield 1, there is a campaign that will feature six different characters each with their own war story, told through the eyes of separate soldier nationalities. From development studio, Respawn Entertainment comes their latest video game title Titanfall 2. Players will still have the competitive online multiplayer component that Titanfall is known for, however, this time around the sequel launches with a full singleplayer narrative campaign. This is something that was often brought up when Titanfall originally released and luckily the developers kept that in mind when crafting up Titanfall 2. Within the campaign players will be taking on the role of Jack Cooper, a Militia pilot that earned his Titan after the mech’s driver was killed-in-action. Now Jack Cooper must work his way back from behind enemy lines. If you’re looking for more competitive gameplay, the online gameplay matches are still fully accessible. The carnage of monstrous mechs and nimble foot soldiers makes combat competitive and intense. There’s a variety of game modes to choose from which may have you tweaking your role, character classes and of course strategy within the team. Likewise, the development team behind Overwatch, Blizzard Entertainment, will introduce new heroes into the game from time-to-time.